What Is DD Form 2766C? DD Form 2766C, Adult Preventive and Chronic Care Flowsheet (Continuation Sheet) serves as continuation sheet for the DD Form 2766, Adult Preventive and Chronic Care Flowsheet. The main form is used to consolidate the information on the patient's allergies, medications, their family medical history, past immunization, and examinations. The form belongs to a set of immunization-related documentation, along with the SF 601 and the CDC Form 731. An up-to-date printable DD Form 2766C is available for download and e-filing below. The Department of Defense (DoD) released the latest edition of the form - commonly incorrectly referred to as the DA Form 2766C - in January 2000. As of today, no copies of the form can be found on the Executive Services Directorate website. The DD Form 2766C - along with the DD Form 2766 - is utilized in Armed Forces Health Longitudinal Technology Application (AHLTA) for active duty, U.S. Army Reserve (USAR), Army National Guard of the United States Soldiers (ARNGUS), non-active duty adult beneficiaries, civilian employees, and contractors receiving care in Military Treatment Facilities (MTFs) as part of their employment. How To Fill Out Dd Form 2766c? The form is used if the authorized personnel filing the DD 2766 run out of space in any of the blocks on the main form. The data fields may be changed to reflect the required type of information. If chemoprophylactic agents are used, this must be clearly defined and documented on the continuation form. Column A should list all medical procedures performed in order to detect, diagnose, or monitor diseases, susceptibility, or to determine a course of treatment. Column B is for the rate at which the test occurred over a particular period of time. Each entry in Column B requires the actual dates of every test or - if the procedure took a significant amount of time- two dates: the beginning and the end dates of the procedure. When the DD 2766C Form is used for a folder version of the main form, it should be filed on the right-hand side of the folder. 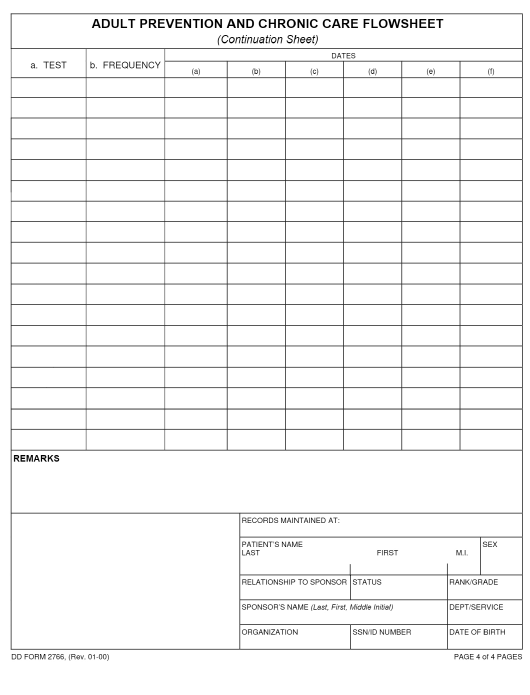 The main form and the DD Form 2766C are printed out for the deploying individuals. The main form - the DD 2766 - will serve as a treatment folder. When the originals are placed back into the service treatment records (STR) or the civilian employee medical record (CEMR), the copies of both forms should be destroyed.